Lovely, lively French lessons will be coming to Shrewsbury soon. To get in touch with our teacher and for more details, click the blue button. Come and learn in a relaxed environment - no homework (it's up to you), no test and no stress - and make friends meeting like-minded people. 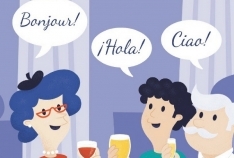 French for Fun Social Event in Newport – Telford – Shrewsbury	Social Event and Taster Lesson coming soon! I'm Cécile. I am French of Spanish heritage. I discovered I loved learning and speaking other languages at secondary school. It was inevitable that Modern Foreign Languages would be part of my education and career too. I came to Britain after finishing my studies and soon got the opportunity of teaching French at a local college. And that was that ! I have been hooked on sharing my passion for languages ever since. I joined Language for Fun recently and I am really excited to be starting classes in Newport, Telford, Market Drayton and Shrewsbury. I can't wait to start sharing my knowledge of French language and culture with you and I'm looking forward to our lovely, lively classes.